I've entered this card in the MMSC11 challenge. It was the most complicated of the cards made at the stamp camp due to the number of different techniques used. However - I love the result. I have to admit some of these results are accidental - I like to call that a bit of serendipity! I left this card in pieces so that the participants could use their imagination to construct it as they wished. It was interesting to see who "needed" to straighten things up - do measurements between windows and generally make a more structured card. I just love how we're all different and would never presume to impose my style on anyone else. I guess that comes from so many years of teaching art - I know I can always learn at least one thing from another crafter and as I continue to develop what is a very eclectic style, I'll continue to enjoy everyone's craft. I've used a modified version of the basic triangle layout for this window card - as found in the Midnight Madness Sketch Challenge # MMSC11. The 3 brads being the tip of the triangle, and the Dove, greeting and 2 brads forming the base. Yes I know it's a bit skewed but ........ I find sketch challenges fun for this reason - you can interpret them quite liberally - and thinking outside the square (or triangle) is something I strive to do. 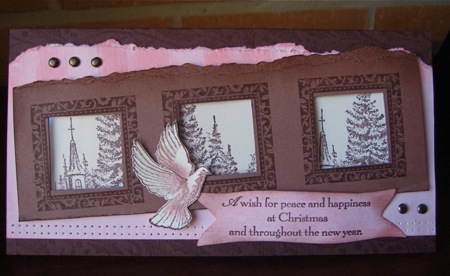 Card stock - chocolate chip, pink pirouette, close to cocoa, whisper white. 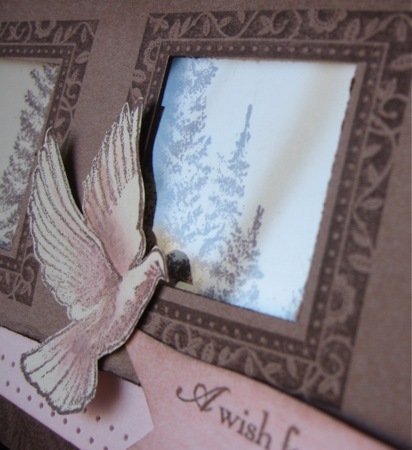 Stamp sets: A Wish For Peace, Frames With A Flourish and Standard Wheel: Soft Holly. Inks: chocolate chip, pink pirouette, pretty in pink, close to cocoa. Accessories:- acetate sheet, paper snips, vintage brads, square punch, blender pens, sponges, matt pack and paper piercer. In an effort to create a more vintage and less structured feel to my card I purposely punched out the squares inside the frames, a little off centre. The torn edges are done freehand and the sponging is random. 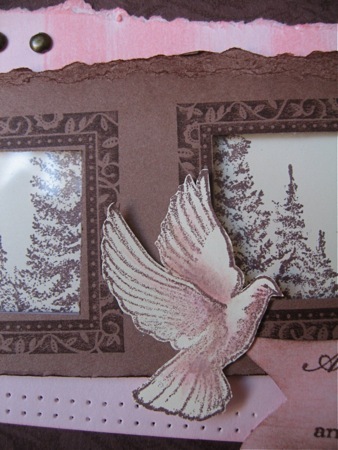 The detail shot shows the depth in the card, plus a number of different inking techniques - Sponging the edges, swiping the ink pad directly along the card (pink upper portion) and colouring the dove with blender pens and inks. You can also just see the effect of using the stampin' around wheel loaded with close to cocoa ink on the chocolate chip card stock at the top of the picture. This forms a soft image that creates more of a texture than an image, and it fades nicely into the background. Can you see the light reflection on the acetate sheet used for panes in the window card? This could be further developed into shaker cards with snow or stars. The uniform paper piercing was aided by using the hole piercing guide from the matt pack - this makes life easy if you love piercing. The MMSC11 challenge will finish soon but you might like to check out the Midnight Madness Sketch Challenges and join in the fun on a weekly basis. Check out their blog and join the fun. Home Page - for lots of links to interesting topics.